The year is 2142. You play as Conrad B. Hart, a man who has lost his memory. After barely escaping from hostile aliens, Conrad's bike crashes on an unknown planet. Conrad finds himself in the jungle, and from now on his quest for survival and his lost identity begins. 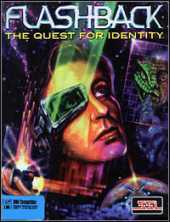 During one of his investigations, Conrad discovers a plot to take over Earth involving aliens called Morphs who disguise themselves as government officials. "Flashback" is a platform action adventure. Your navigate Conrad over the platforms, performing various moves. You can simply jump or do a longer run-and-jump, run, climb, hang off ledges, and pick up objects lying on the ground. To defend yourself, you shoot enemies with your gun and also use various objects (such as stones) to harm or to distract them. It features fully hand-drawn backdrops and for its time remarkably fluid rotoscoped animation of walking, running and jumping movements, reminiscent of Prince of Persia. Later a version on CD-ROM was released with new cinematic scenes, better animation between levels and added voice actors to the character's dialogue. On Dec 4/2018, Flashback: 25th Anniversary was released. A refreshed version based on the SNES graphics and also offers a new Modern mode featuring enhanced graphics, remastered sound effects, and a Rewind option (allows to move back), and a tutorial.